Australian authorities plan to corral about 6,000 wild camels with helicopters and gun them down after they overran a small Outback town in search of water, trampling fences, smashing tanks and contaminating supplies. The Northern Territory government announced its plan Wednesday for Docker River, a town of 350 residents where thirsty camels have been arriving daily for weeks because of drought conditions in the region. "The community of Docker River is under siege by 6,000 marauding, wild camels," local government minister Rob Knight said in Alice Springs, 310 miles northeast of Docker. "This is a very critical situation out there, it's very unusual and it needs urgent action." The camels, which are not native to Australia but were introduced in the 1840s, have smashed water tanks, approached houses to try to take water from air conditioning units, and knocked down fencing at the small airport runway, Knight said. 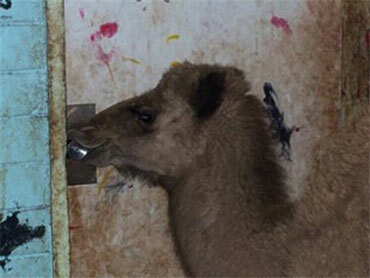 The carcasses of camels killed in stampedes at water storage areas are contaminating the water supply, he added. The government plans to use helicopters to herd the camels about nine miles outside of town next week, where they will be shot and their carcasses left to decay in the desert. The state government will give a 49,000 Australian dollar ($45,000) grant for the cull and to repair damaged infrastructure in the town. It is common to see some camels in the remote community, but a continuing drought and an early heat wave have dried up other water sources and forced great numbers of them into town. Much of Australia is gripped by some of the worst drought conditions on record. In August, the federal government set aside 19 million Australian dollars for a program to slash the wild camel population, including a possible mass slaughter. Glenys Oogjes, executive director of national advocacy group Animals Australia, said the plan to kill camels by helicopter was barbaric, and that the community could instead focus on setting up barriers to keep out the camels. "It's a terrible thing that people react to these events by shooting," she said. "The real concern is the terrible distress and wounding when shot by helicopter. ... There will be terrible suffering." Camels were first brought to Australia to help explorers travel through the desert, and now an estimated 1 million roam wild across the country. Docker River residents were not especially concerned when about 30 camels came into the town looking for water a few weeks ago, said Graham Taylor, head of the local council. But their fears grew as more animals arrived day by day. He said many people were too frightened to leave their homes because of the big, strong animals, which can grow up to 7 feet tall and weigh 2,000 pounds. "We need to get the risk and that threat away from the people," Taylor said.